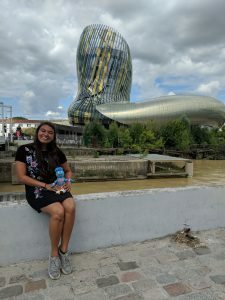 This past summer I had the incredible opportunity to study abroad in France. 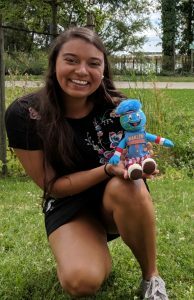 I spent one week in Paris and five weeks in Lyon; however, unlike the rest of the students in my program, I stayed after the program to continue traveling on my own. The generosity of the Globetrotter Grant program allowed me to extend my journey. I planned to stay for an extra ten days… I guess I should have known that planning is futile when it comes to being abroad! Globie and me at the train station in the little town outside of Valensole where I had to catch the train/taxi (because Valensole is too small to have its own). As soon as the program ended, I took a train, a bus, and a taxi to get to the tiny town of Valensole, Provence. 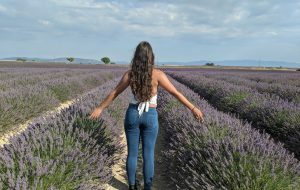 Once a year, Valensole hosts the largest and most popular Lavender Festival in the entire country and I was so excited to fulfill my dream of exploring fields of lavender. My train arrived in Aix-en-Provence only four minutes before my bus was supposed to leave so I had to jump onboard quickly. When we arrived at the station, I realized three things: 1) we weren’t in Valensole 2) Valensole doesn’t have a train/bus station and 3) the town where I would be staying was not actually Valensole. I took a deep breath and did something that terrifies me even in English (inexplicably): made a phone call. I googled “taxis near me” and called the first company that appeared. After a brief struggle totally due to my awkward phone mannerisms, my taxi driver arrived to take me to my hotel. I spent the night exploring the little town where I was staying that night, including my first time ever eating at a restaurant by myself. 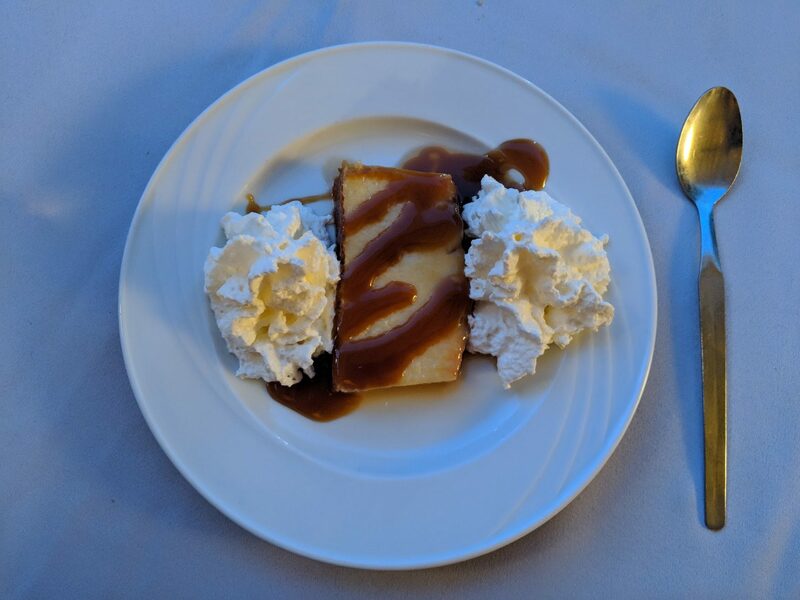 I didn’t totally mind being alone, although I didn’t appreciate the waitress calling me “the girl all alone” when talking to fellow waitstaff. Oh well. I woke up early the next day to head to Valensole and explore the lavender! What I hadn’t considered was the fact that lavender is a flower, which attracts bees. Bees (and other flying, stinging insects like hornets, yellow jackets, wasps, etc.) are my GREATEST fear, but I took a deep breath and plunged into the rows of flowers anyway because there’s no way I was going to travel all the way to Provence without getting my lavender picture! After exploring the festival for a while, I hopped back in a taxi (followed by a bus and then a train) to return to Lyon for the World Cup Final. France won, and the entire city became a chaotic party; it was so much fun to be a part of the victory. The next day, I caught another train back to the south of France. As I mentioned in my grant application, I wanted to visit as many regions of France as possible this summer. 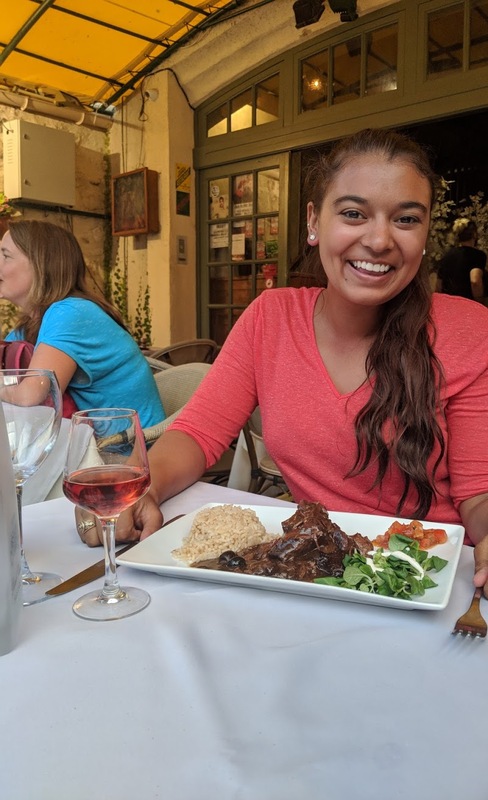 My study abroad program took me to the Auvergne-Rhone-Alpes region (Lyon) and the Ile-de-France (Paris), the lavender fields took me to Provence, and finally I was on my way to the city of Aigues-Mortes, located in the Camargue of Languedoc-Roussillon. 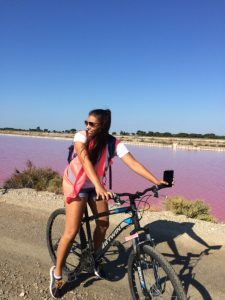 Me on my bike tour of the Salins of Aigues-Mortes – notice the pink water behind me!! The beautiful, walled medieval town intrigued me when I was planning my trip because I had heard of the Salins de Aigues-Mortes: the salt deposits. On my first afternoon and evening, I walked along the walls and took in city views. 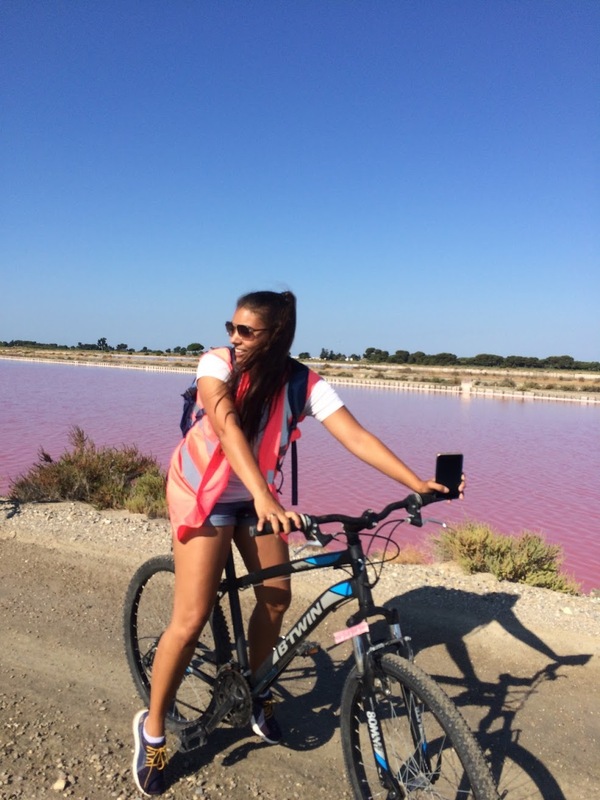 On the second day, I took a bike tour of the salins. I woke up bright and early for my 8 AM tour, which I shared with a group of people visiting from all around France. I learned that the salt trade in Aigues-Mortes has existed since medieval times; the city was and remains the largest exporter of salt to the entire Mediterranean region. Because of the salt and mineral buildup, all of the sea water trapped in the reservoirs has turned pink! The unique chemical composition of the water makes it habitable to the type of fish favored by flamingos, so many colonies of them have taken up residence in the area. We were lucky enough to see a flock fly directly overhead; I didn’t even know flamingos could fly! I also learned that there are many types of flamingos in varying degrees of pink; the ones in zoos are usually the pinkest kind, while the ones in Aigues-Mortes are closer to a white-ish color. Enjoying my last meal in Aigues-Mortes: bull! After my tour and lunch, I hopped on a tour boat to see the famous countryside of the Camargue, which is kinda like the French wild west. The land is mostly used as ranchland to raise bulls, one of the delicacies of the region. Camargue is also known for its wild horses, and I was lucky enough to spot some from my river cruise. As we pulled back into the city, we heard thousands and thousands of crickets; apparently the south of France is known for the sound of crickets! When they mate, the male crickets use their abdomens to make the sounds that are so familiar to us, and the extremely large population of crickets in the south of France makes the sound a part of daily life for the people living there. 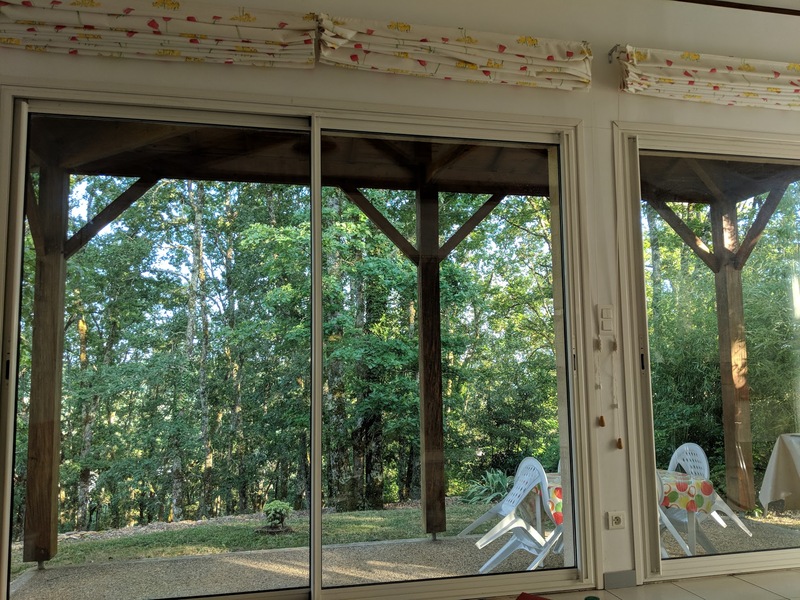 The view from my Airbnb in Lascaux. After a truly relaxing couple of days in Aigues-Mortes, I found myself back at a tiny train station ready to head to my next stop: Lascaux. The city of Lascaux, located in the Dordogne region, is famous for its paleolithic cave art. I arrived late that evening and since it was such a small town, most things had already closed down for the day. My taxi driver was friendly and talkative, and he actually knew the family that owned my Airbnb! When I arrived, they asked about his wife and kids. It really was a small community! I grabbed dinner to go from the main street and came back to my little cabin for the night. The view was beautiful, so I’ve included a picture of it as well. The next day I woke up early once again to head into the town. After being abroad for so long, walking was a huge part of my daily life and I wasn’t even slightly intimidated by the 45-minute walk from my cabin to the cave museum. Once I arrived I learned the layout of the caves; as it turns out, the actual caves are closed to the public and have been since the late 1980s due to deterioration of the artwork. 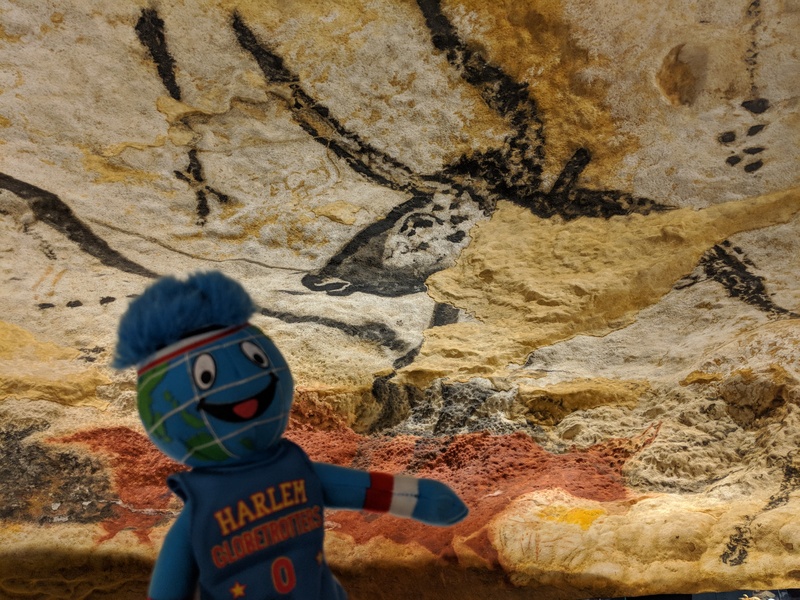 Globie admiring the Lascaux cave art. An exact replica of the caves was created in almost the exact same location and named Lascaux 2. Shortly afterwards, Lascaux 3 and 4 opened. 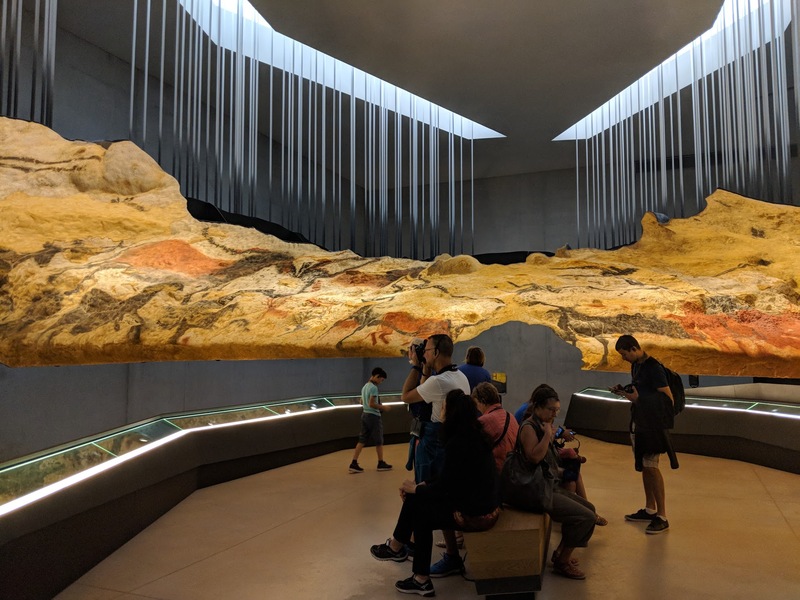 Lascaux 3 is another replica of the caves, while 4 is a replica including an interactive museum where photos are allowed. I chose to go to Lascaux 4 so that I could take pictures. I went on a guided tour of the replica caves and learned so much from the guide, then he left us at the interactive museum where I took pictures of the art and listened to detailed explanations from both my audio guide and the tour guides working in the exhibits. I left the museum complex around lunchtime, so I ate lunch at a restaurant along the river. For the rest of the day I explored the town and shopped, then I headed back for an early night. The setup of the Lascaux 4 interactive exhibit. Each piece of the cave was reconstructed and suspended in its own area of the room so guests could read the corresponding plaques that described every inch of the art. After Lascaux, I boarded my (3 hours late) train to Bordeaux, located in the Nouvelle-Aquitaine region. My first night in Bordeaux was relaxed. I read my Kindle and spent a few hours tasting different wines at the city’s most famous wine bar: Bar du Vin, it was one of the most relaxing nights I’d had so far! Inside one of the châteaus in Saint-Emilion. The next day I was up bright and early again to head out on a biking tour of the nearby town Saint Emilion, known for its vineyards and wineries (called “chateaus” in France). 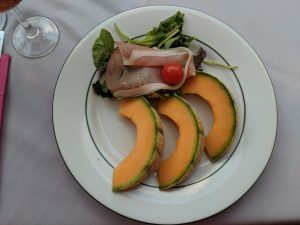 I saw three different chateaus including tastings at each one, and I was served a delicious lunch at one of the chateaus. I even bought a fancy wine for myself there because I loved it so much in the tasting! 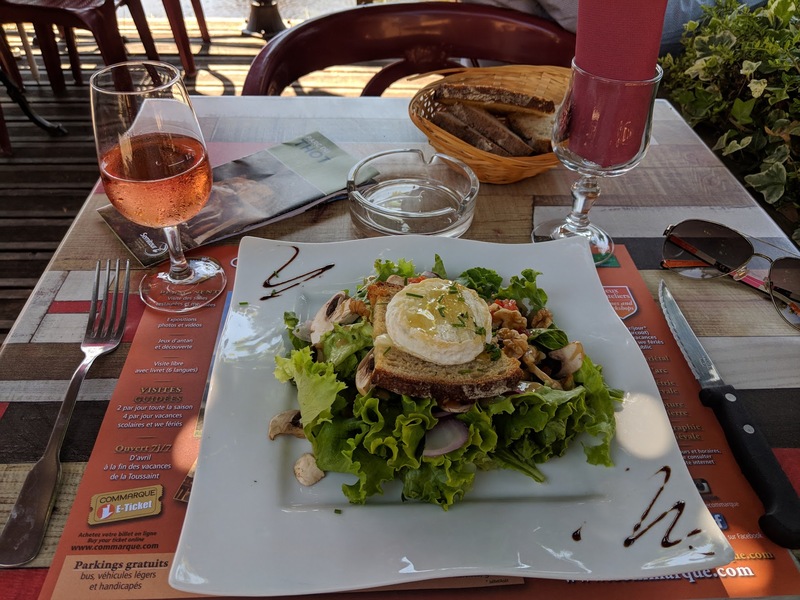 We also biked into town and got to walk around Saint Emilion with our tour guide, including stops at a ridiculously priced wine shop, an original medieval house, and an old church built directly into a limestone deposit. It was definitely an interesting day. 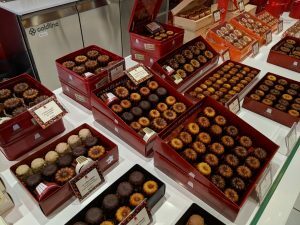 Canelés, a traditional Bordelaise (meaning: from Bordeaux) dessert. 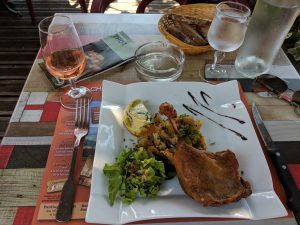 In Saint Emilion, I learned that the dessert started because raw egg is used as a method of filtering wine. 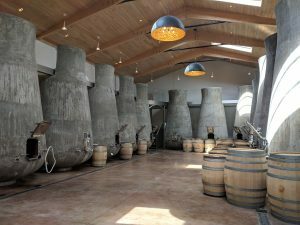 When the wineries were finished with the eggs, they would throw them away. One day a baker started collecting these leftover eggs and using them to make these desserts. After returning to Bordeaux, I did some of my own sightseeing following a city guide that I downloaded from the “Visit a City” app and ended up back at Bar du Vin to top it off. 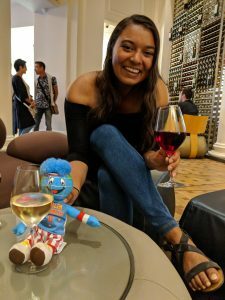 My third day in Bordeaux was dedicated to the Cite du Vin museum, an attraction that I knew would take hours. Me and Globie in front of the Cité du Vin museum – it was built to look like a decanter! 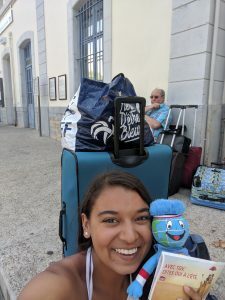 The next day I boarded my bus to return to Paris for what was supposed to be my last night in France; however, when I arrived in Paris, I realized that my backpack was missing. It had my laptop and passport inside so I started to freak out, but what I thought was going to be miserable ended up being… a learning experience. I got to see the inside of the U.S. Embassy in Paris, where I went to get my new passport. I also filed a police report entirely in French, which made me proud of my linguistic skills. 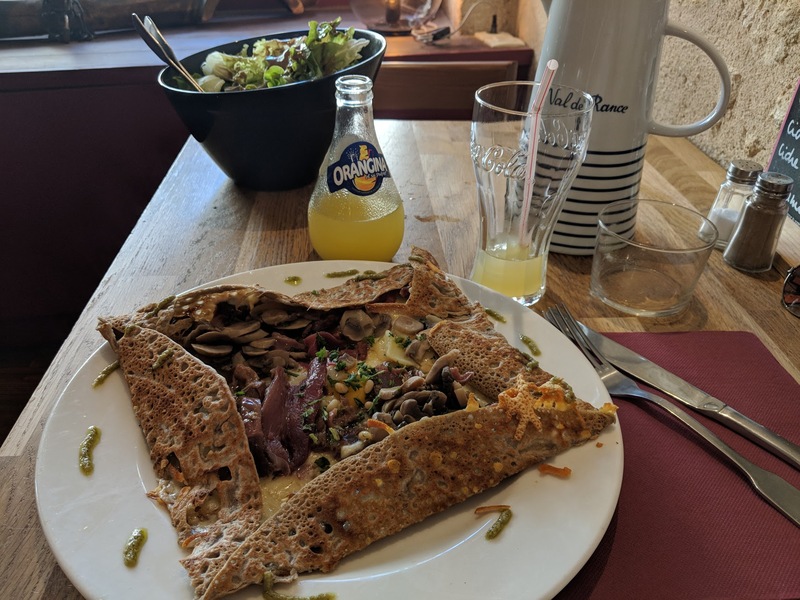 Finally, since I had to change my flight, I was gifted with an extra day of tourism in the city, which I actually ended up using to visit Giverny. In Monet’s Japanese garden in Giverny. 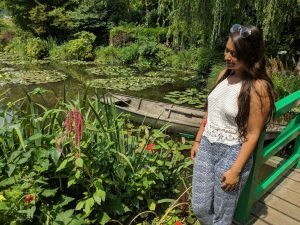 Although it’s about 45 minutes from Paris, Giverny was a special stop for me because I am an avid lover of impressionistic art. The impressionist museum was closed for the whole month of July, but I still got to spend the day exploring Monet’s property. I walked through his entire home, admiring the unique use of color and natural light. Next, I explored his flower garden, which contained exotic varieties from all over the world. Finally, I wandered into his famous Japanese garden and admired the water lilies. In this way, my two months in France came full circle; in my first week in Paris I had visited the Orangerie museum to admire Monet’s water lily paintings, and in my last day in France I got to see his inspiration! All in all, this was an extraordinary trip. 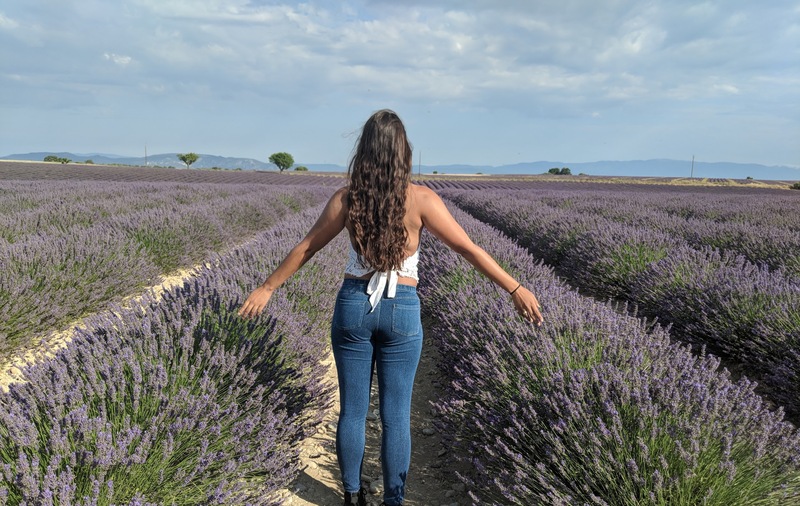 Thanks to the Globetrotter Grant committee I was able to fulfill my childhood dream of seeing lavender fields in Provence, see the Lascaux caves that I learned about in middle school French class, and eat my way through so many different regions of the country. My taste for art was satisfied in my trip to Giverny, and my taste for wine was more than satisfied during my days in Bordeaux. Tasting wines at the Bar du Vin in Bordeaux. 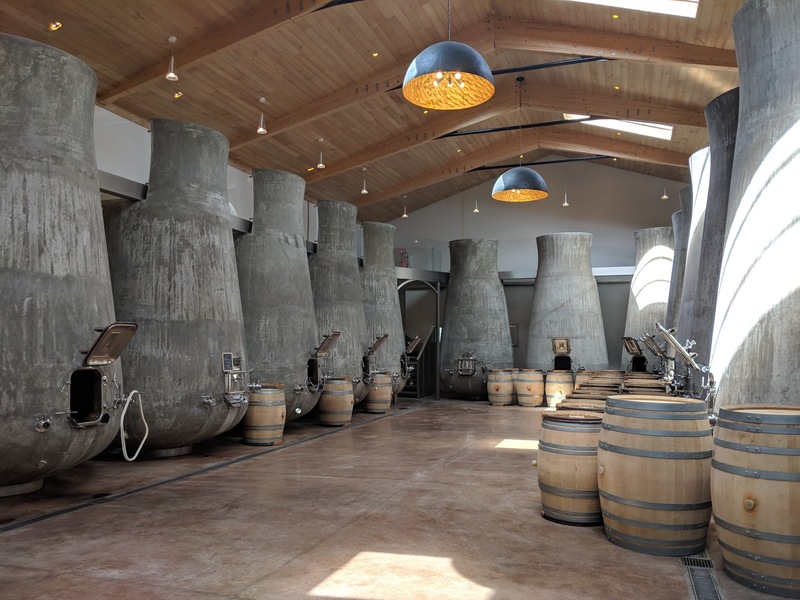 After taking an enology class and making my own wine, hearing words like “terroir” and “tannins” again felt right at home and I loved having the opportunity to apply and solidify concepts that I had learned at school. 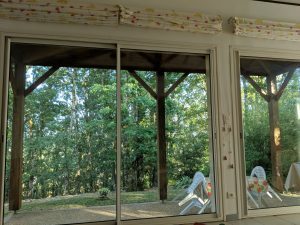 I saw whimsical places like the pink waters of Aigues-Mortes and relaxed on trains as fields of sunflowers raced by the windows. Through every interaction, every day, my French came easier and easier. I’m so grateful to have been chosen for this incredible experience! 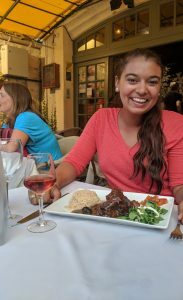 Because food was an integral part of my grant proposal and desire to travel, here are some pictures and descriptions of my favorite meals! 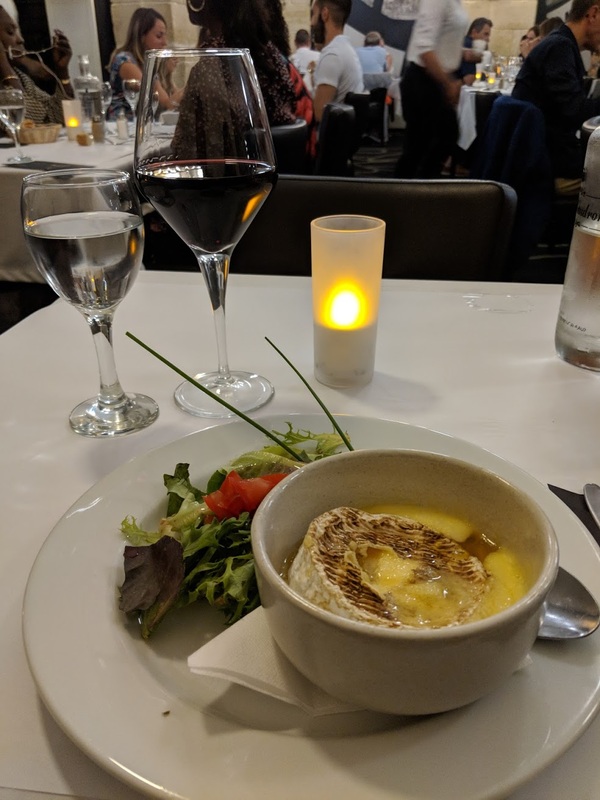 Melted Brie appetizer that I ordered one night in Bordeaux – sooo good. Duck confit that I ate at a riverside restaurant in Lascaux. confit… Yeah I was really full at the end of every meal this summer. 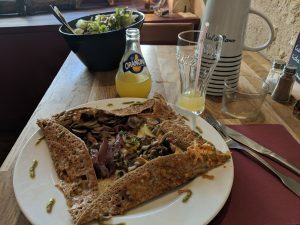 The crêpe that I ate as my last meal in Bordeaux. A crême caramel dessert that I ate in Bordeaux. A delicious brownie that I ate in Lascaux. 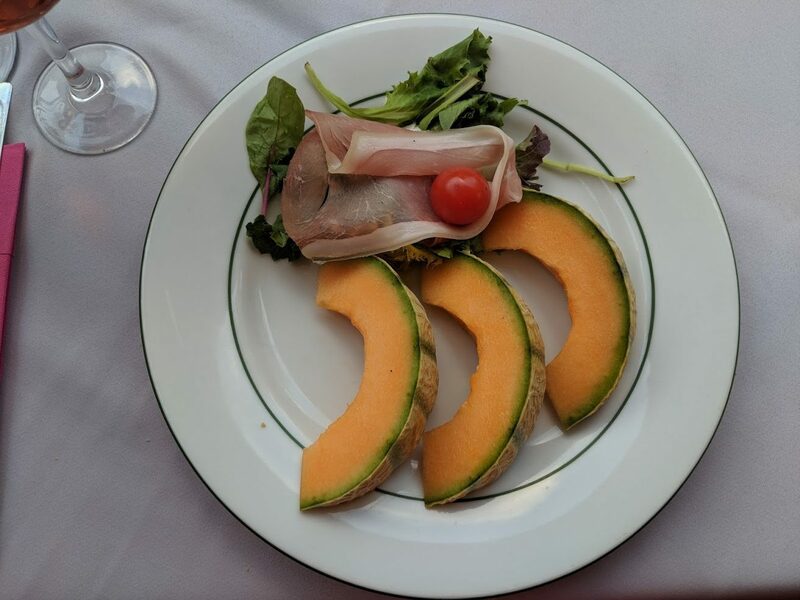 A traditional salade jambon et melon that I ate in Aigues-Mortes. 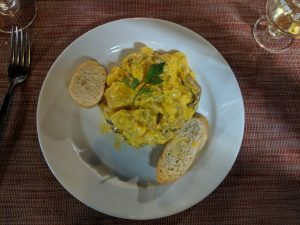 A Provençal squid dish that I unfortunately forgot the name of but really liked! 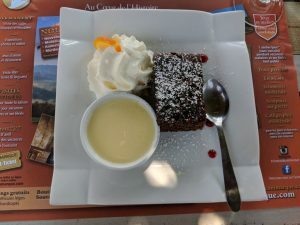 I ate it in Aigues-Mortes. Check out these videos by STA Travel Australia!